Based on the video, Patrick Ward, Executive Director at Deaconess Associations (the Cincinnati health services corporation that has wholly owned the Heimlich Institute since 1997) appears to have dreamed up the program. The video includes interviews with him and with my father, both board members of the Heimlich Institute. 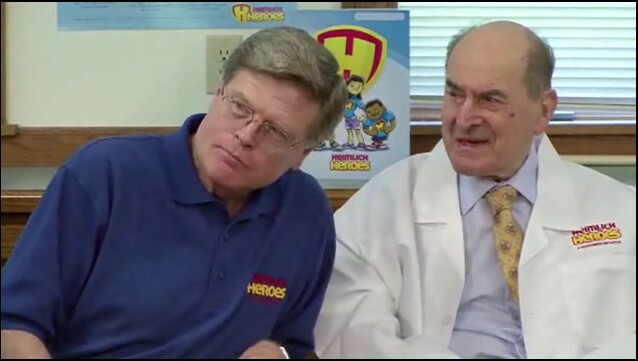 Here's Ward wearing a "Heimlich Heroes" polo shirt and my father wearing - yes - a "Heimlich Heroes" lab coat. As I understand the program, EMTs visit local schools and teach students how to perform the Heimlich maneuver and hand out "Heimlich Hero" t-shirts. 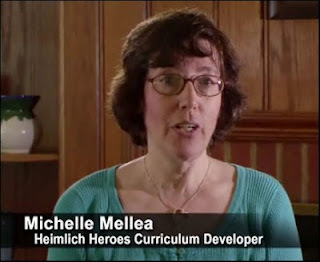 According to the video, the curriculum was developed by Michelle Mellea, a science teacher at Cincinnati's Bethany School, "an Episcopal day school, serving girls and boys from kindergarten through the eighth grade." 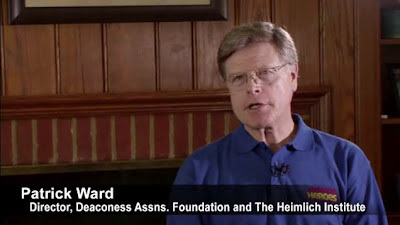 If Ward's program is an attempt to revive the "Heimlich brand" to counter the scores of critical media reports that have appeared since 2003 about my father and the Institute, he's probably got his work cut out for him. First, in 2006 the American Red Cross "downgraded" the Heimlich maneuver to a secondary treatment response for choking. The Red Cross now recommends first performing a series of back blows. If that fails to remove the obstruction, rescuers are instructed to proceed with "abdominal thrusts." They don't even call the procedure "the Heimlich maneuver" anymore. Second, the Heimlich Institute's website continues to promote my father's long-discredited claims that the Heimlich maneuver is effective for reviving drowning victims, for stopping asthma attacks, and for curing cystic fibrosis. 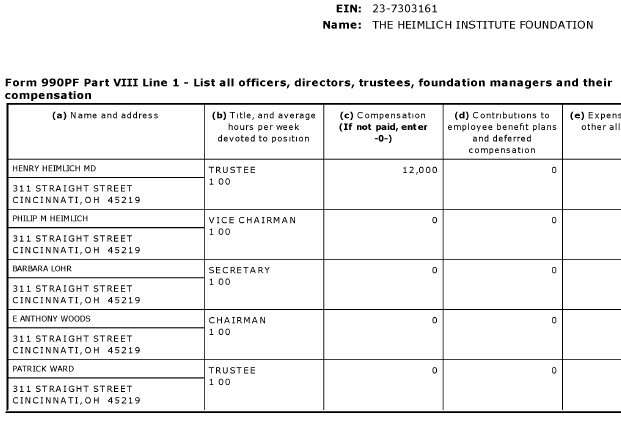 Third, as recently as 2005, reportedly the Heimlich Institute was conducting illegal, unsupervised medical experiments on prostitutes in Ethiopia and Gabon, alleged "research" based on a treatment my father calls "malariotherapy." Over the decades, he's claimed that cancer, Lyme Disease, and AIDS can be cured by infecting patients with malaria and his organization has engaged in a series of notorious, violative human experiments on both US and foreign nationals. Fourth, per this 2006 ABC Chicago I-Team report, for years the Heimlich Institute has been an organization in name only - no office, no employees, just a website. Fifth - and this may be the kicker - the shirts make you look like a major dork. UPDATE, 4/22/12, 10:30AM: I just came across this Cincinnati Enquirer story on the program, Young students soon to become Heimlich Heroes by reporter Cliff Radel. It's dated 4/20/12, but didn't show up on my Google News search until this morning. It includes some interesting information that I plan to report in a follow-up Sidebar item.